What is this? Just a strawberry, right? Oh, no–no, my friend. This is one of the first strawberries of the season in Georgia. Unlike many CSAs, my CSA provides subscribers (for an additional fee) the option of picking and choosing what we’ll receive from the local produce/products they currently have available. Two weeks ago, when I visited the CSA website to pick what I wanted, I clicked on the link for available fruits and nearly jumped out of my chair. The first Georgia strawberries had come in, and they were certified organic, too! Noting the high price, I ordered just a pint instead of the vast quantity I considered. When I arrived home, I bounced up and down gleefully as I told my husband that we were going to have strawberries coming in. “Okay,” he responded pleasantly but calmly, seeming a bit confused. I am certainly the more excitable of the two of us, but I’m also the meal planner. I realized I had a bit more explaining to do. Now, I know that at any time in the last year, I could have gone to Wal-Mart, or Kroger, or Whole Foods, and I could have bought some strawberries from California or Chile or Peru. But strawberries taste best fresh, and buying strawberries from a far-flung location—even if the strawberries are organic, as nearly everything I buy is—would mean contributing a whole lot of calories of oil energy, its inherent pollution, and its contribution to climate change, for the sake of me eating something that was subpar, something I could eat in much finer form if I just waited a few months. I don’t eat everything in season, but I try as much as I can. And good strawberries are worth waiting for. Do you ever get the feeling that there’s little on the planet that’s exciting anymore–that, having nearly everything available to us, right at our fingertips, it’s hard to feel all that thrilled by life? Do you ever feel like the choices we have are sometimes just overwhelming? Maybe even depressing? Choosing to eat seasonally is one way to take back a sense of appreciation, a way to utilize limitations to provide a sense of excitement and nourishment rather than deprivation. Rare things are precious, and learning to eat seasonally makes foods rotate from abundance to rarity (or non-existence) on a regular basis–it makes various foods precious, and exciting, as the year revolves. Choosing to eat seasonally is a way to learn to eat a variety of fresh, whole foods and naturally rotate foods over the course of a year. It’s a way to eat foods in their freshest state, which means when they are highest in their nutrients. It’s also a way to contribute your money directly to the local economy, and, as I mentioned, to decrease the impact your life’s consumption is having on the planet and its current and future in habitants. For me, eating seasonally—eating locally produced foods—provides a homey structure for what I choose to prepare for our meals. It is inspiring, and it is comforting. 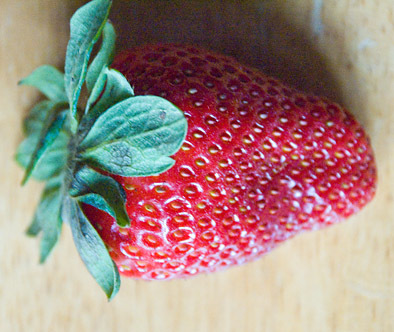 After I placed my CSA order, I had 6 days to daydream about what to do with those sweet first-of-season strawberries. When they arrived, I savored a few straight-up as soon as I got the package home. Chewy, sweet, with the zing of the tiny seeds–delicious. I continued to ponder the strawberries for the next couple of days. Then I realized my second loaf of the fantastic gluten-free, vegan bread (see recipe in previous post) was going a bit stale. The inspiration appeared: I used the rest of the strawberries for a chocolate-strawberry bread pudding, where the strawberries baked up as a jammy contrast to the rich, smooth chocolate and chewy bread. And, of course, I had to share it with friends, and I had to freeze some to serve my husband when he arrived home from his trip. Precious things are often more fun when they’re enjoyed in community. 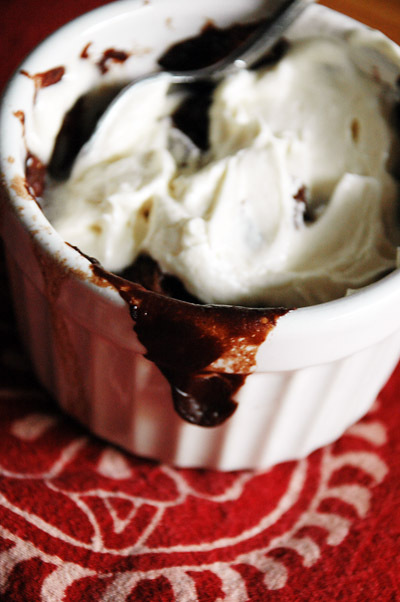 In a small bowl or ramekin, use a fork to whisk the cocoa with the hot water. (Start with 1 T and work up from there, if necessary.) In a large bowl, combine the cocoa mixture, milk alternative, egg replacer, sugar, salt, vanilla, and Kahlua. 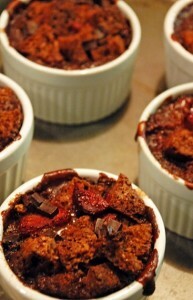 Add the bread, strawberries, and chocolate chunks, and mix well. Bake in 6-8 ramekins for ~25 minutes or in a casserole dish for ~1 hour–until the top mostly firms up. You’re so lucky–fresh strawberries! I bet they were phenomenal. When we were kids, we’d wait all year for that 2-week window when my mom would bring home fresh cherries from the grocery store. Nothing tasted as sweet! Great post … love the strawberry photo! Wow, you have a long season. Today is my blog birthday … I invite you for cake (or a look at a cake)! I’ve listed your blog as on of my favorites this year and I’m adding you to my new blog roll side bar. I am right there with you in your seasonal approach, I try to buy as much as possible locally and organic and am working on ridding ourselves of fuel calories from items shipped across the country. Avocados are a weak point however. No one grows them in MI. Everyone in the south is mentioning strawberries already. I am happy for you guys, but jealous! We have almost 2 months to go! My uncle owns a strawberry farm in NW MI and I used to help pack those berries at 7 am every morning for the local markets. During the process I ate at least a quart of fresh unwashed berries a day. I do have two strawberry plants in the backyard that should produce this year, if I can keep the squirrels away! Our next fruit in season is rhubarb! My little plant is just starting to put leaves out. I can see that Barbara Kingsolver’s book Animal, Vegetable, Miracle affected us both in a positive, changing way. I just ate the first garlic chives from my own garden. So my “eating from the back yard” season is officially underway! I understand your enthusiasm. Around Memorial Day I’ll head down the road to the U-Pick-‘Em strawberry patch and try your recipe. I, also, would like to add you to my blogroll . . .as soon as I figure out how to add a blogroll. I’m getting the hang of it, slowly. Whole-y Foods had boxes of Georgia strawberries last weekend, so we had to get them. If anything, they might’ve been too fresh, as some were still a bit green. Still, was good to buy locally. Tasty, too. I try to buy locally and in season, but sometimes it’s hard to do in NY. I can’t wait for our local vegetable market to open. Everything is grown here in Westchester County and I love knowing that I’m helping our local farmer and all the folks he employs.